^ "...вес 69кг в соревновательный сезон.."
^ プルシェンコの連覇を妨害した! ?米国人ジャッジ、疑惑のEメール。 - 五輪でのロビー活動の真実 - Archived 2010年2月27日, at the Wayback Machine. ^ International Skating Union (6 2010). “Decision of the ISU Council on Eligibility of Mr. Evgeny Plushenko (RUS)” (PDF). Communication 1622: 4-5. オリジナルの2010年7月3日時点によるアーカイブ。. https://web.archive.org/web/20100703114929/http://isu.sportcentric.net/db/files/serve.php?id=1902. 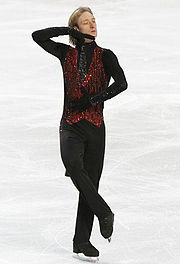 ^ Provisional Allotments of ISU Championships and Reinstatement of Evgeni Plushenko, 14 Jun 2011 Archived 2011年6月17日, at the Wayback Machine. ^ プルシェンコが腰手術 Archived 2013年2月1日, at the Wayback Machine. ^ ソチ五輪：フィギュアスケート 男子SP Archived 2014年2月16日, at the Wayback Machine. ^ Евгений Плющенко: "Я никогда не останавливался и не собираюсь"
^ 「His trademark is a Biellmann spin, and so far, he is the only male skater to show this element in senior competitions.」 Archived 2001年12月18日, at the Wayback Machine. ^ The Moscow Times - "I think I should lay lawmaking aside, leave it and pursue sports" Archived 2010年3月3日, at the Wayback Machine. ^ Евгений Плющенко получил орден почета Archived 2010年3月17日, at the Wayback Machine. ^ Указ Президента Российской Федерации от 5 марта 2010 года № 278 Archived 2013年4月26日, at the Wayback Machine. ^ http://evgeni-plushenko.com/eng/news/112.htm Congratulations on the birth of a son! ^ «Хочу стать легендой фигурного катания» Archived 2011年5月12日, at the Wayback Machine.